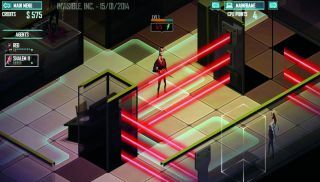 Invisible, Inc. has a new alpha update along with a sharp video outlining some of the latest changes to the turn-based, espionage game . It's the ninth update for developer Klei Entertainment's alpha, with the new build giving players greater infiltration options but also tougher guards to try and deal with. The game's player-controlled agents now have a new type of character upgrade call Augments, a change you can see previewed in the video above. The developer wants player progression to be a more "meaningful" experience and the Augments have been added to address that. "They create an important choice though, as installing an Augment permanently uses an inventory slot," according to the update description. "They provide ways to get boost of speed or multiple actions within a turn allowing your agents to pull off some sweet combos." Hardier Tier 2 guards will now appear in the game and the stats of all guards have been boosted. The developer hopes tougher guards will mean combat becomes less "accessible a solution to most of the games challenges." In order to make stealth more attractive, the new alpha version also introduces a hide mechanic allowing agents the chance to slink behind cover as well as changes to guard patrol patterns. Cassandra Khaw spent some time with Invisible, Inc. last month and found "a lot to be excited about." "Klei Entertainment's clean, comic book art style works fabulously with the slightly campy '60s spy movie aesthetic," writes Khaw in her hands-on. "If you're willing to contend with a nighvertical learning curve (or dally with a community guide), it's definitely worth picking up in its current state." It's worth pointing out the update added a tutorial to offset what even the developer observes to be an "insane" learning curve, according to the patch description. Access to the alpha currently costs $17 through the game's website which gets you a copy for yourself as well as an extra to give to a friend when the game officially launches.